A brand new deleted scene from Avengers: Infinity War has been released online. Marvel has been sharing a few of these tidbits that fans are going to be treated to when they pick up the movie for themselves. 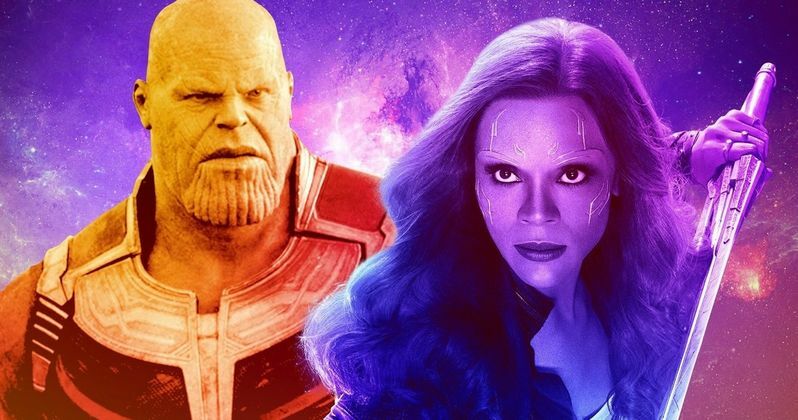 In honor of the blockbuster making its way to home video on digital platforms today, another deleted scene has been released that further explores the complicated and messed up relationship between Zoe Saldana's Gamora and Josh Brolin's Thanos. The scene has Thanos using the Reality Stone to show his adopted daughter Gamora a glimpse into the past when she was out, somewhat happily, or so it would seem, doing his bad deeds. "By the look of it, you seemed content enough at the time," the Mad Titan says. "I was a prisoner!" Gamora counters. Thanos actually shows his compassionate side a bit, explaining to Gamora the special place she occupies in his heart. "After my planet died, I had nothing. No one. And I thought I never would. I was all right with that; I had a new vocation. And then I found you, and at my side you became the fiercest woman in the galaxy." This actually serves as an extended version of the scene that ended up in Infinity War, wherein Thanos correctly accuses Gamora of withholding the location of the Soul Stone. The scene is finished enough to work reasonably well, but the CGI isn't quite complete and it looks a bit off at moments as a result. Given what ultimately becomes of Gamora in the movie, with her adopted father having to sacrifice her in order to actually get the Soul Stone, this sequence adds some more depth to that heartbreaking moment. Another deleted scene shows the Guardians of the Galaxy trying to rally after the loss of Gamora. Those are just a couple of bonus items that will be included with the home video release of Infinity War. Those who are content to own a digital copy can do so now, via their preferred digital retailer. Those who are holding out for a physical copy are going to have to wait a couple of weeks until August 14, when the movie arrives on Blu-ray, DVD and 4K. Infinity War went on to become just the fourth movie ever to cross the $2 billion mark at the worldwide box office. That has positioned Avengers 4 as one of the most highly-anticipated sequels ever. There is honestly no telling what Marvel and the Russo brothers have in store for us when Avengers 4 actually arrives next summer. For now, it looks like the remaining heroes are going to be avenging their fallen partners. However, we can't totally rule out another confrontation between Gamora and Thanos, if next year's follow-up gets as crazy as it looks like it's going to get. For now, you can check out the newly revealed deleted scene, courtesy of USA Today, for yourself below.